The Ultimate Storage stuffed animal Bean bag Cover Has Just Been Released! Parents Wait No More! stepping on stuffed animals all the time? kids' toys taking over the room? small toy boxes and bulky storage chests? If so, then Brolex has something really interesting for you. The finest storage and organizer bean bag cover. Piles of Toys Tuck Them All In A Brolex Oversized Bean bag Cover! Stop tormenting yourself with small size storage bags. Invest in a Brolex stuffed animal bean bag cover and organize even the tiniest space. Being oversized yet compact, this storage bag can hold anything that comes to mind. From stuffed animals, plush toys, pretend play gear, puzzles, drawing kits, and balls, to pillows, quilts, blankets, seasonal clothing, and other pliable objects. The world is your oyster. Don't want to use it for storage? Fill it with soft and smooth pouf inserts and create the most bean bag chair ever. Have fun with your kids, sit on top, take a quick nap and relax. Forget about the tidying nightmare. Teach your kids about the importance of organization and how to keep their rooms neat. · Playful and perky dinosaur patterns. Unisex for girls and boys. · Stuff n' Sit beanbag. Holds your kids' toys. · Ultra resilient yet smooth zippers! · Washable fabric. Hassle free maintenance. · Reinforced stitching. Ready for heavy duty use. · Carrying and hanging handle on top.
. Extra Large size :38'' . HOLDS ALL OF YOUR KIDS' TOYS: Forget about toys all over the floor. Forget about cleaning all the time. Forget about messy rooms! Get yourself the most multipurpose bean bag chair cover and find your peace of mind again. Store inside all of your kid's toys, teddy bears, dolls and stuffed animals pillows, blankets, clothes and keep your floors tidy from now on. SWEAT FREE CLEANING: Save your precious time from cleaning, with this machine washable stuffed animal bean bag cover. When it's cleaning time, simply toss it in the washing machine and let stuffed animal bean bag do the rest! Less time washing, more time spent with your kids. Worry no more about colors fading and fabrics shrinking. This cute toy organizer storage cover is here to stay. COMPLEMENT THE NURSERY: Add color, character and a touch of organization to the nursery with a Brolex toy storage bag chair cover. Explore the many uses of our lounging pouf today. Use it to store toys, declutter the bedroom, hide the floor mess in a heartbeat and carry towels or pillows. Use the top hanging loop to facilitate carrying or storage! 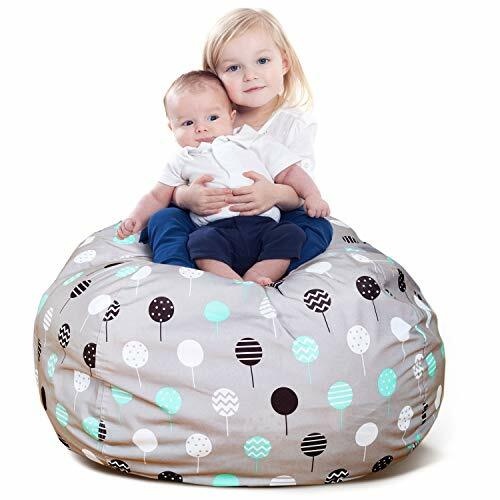 GET THIS BEAN BAG ORGANIZER RISK FREE: Since your satisfaction is our top priority, this storage bean bag cover is backed by our unconditional money back guarantee. Get yours today or make the best baby shower gift ever. Use as a toy storage pouch, pillow organizer, laundry basket, sit and play chair or lounging beanbag. If you have any questions about this product by BROLEX, contact us by completing and submitting the form below. If you are looking for a specif part number, please include it with your message.